Last night while at church I got a phone call from my nephew and while I usually don’t answer calls during service for some reason I walked outside and answered the phone. Wesley (my 14 yr old nephew) said I DID IT!!!! I knew he must of shot a buck with his bow as soon as he said it, he lives with my MIL and two years ago I found a spot close to the house where 4 game trails crossed and we put a ladder stand up for him to hunt and everyday during the season that kid is hunting that set up. Well after school he came home and got dressed and headed to the stand, he said it was slow but he’s had a few does come by on camera but no bucks, last night about 6:30 the two does come into his spot and as he went to draw one of them spotted him and she blew and they took off, not a few seconds after that this buck jumped the fence and at 4 yards he drew back and let an arrow fly, he said he hit a little far back but was an ok shot the deer walked about 10 yds and he sent another arrow and this time it hit the mark. The deer ran off! He called me and we where both excited, he waited 20 minutes and he got down and found blood immediately, we stayed on the phone as he trailed the buck and within about 10 minutes and 80 yds he saw his two lighted nocks glowing through some brush and the excitement in his voice was awesome!!!! 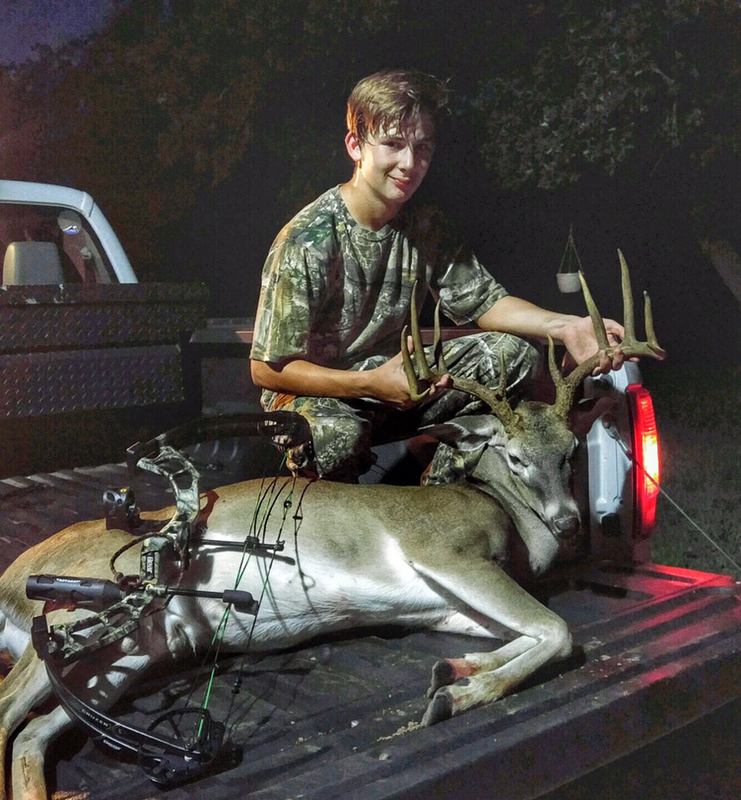 This young man is ate up with hunting and to see him be successful is the so awesome, this was his first deer with a bow and it will be hard to top!!! Very nice deer. Congrats to the young man. Awesome. Great Buck, especially with archery equipment.. Congrats to the Young Man.. Awesome deer! Congrats to him! Location: Wimberley Texas/Hunt every place I can! Hooked for life! Congrats to him. Congrats to the young man! Great buck and a great story! Congrats to the young man! Thats awesome !!! Congrats to your nephew !!! A great buck! Congrats to the young man! That's what its about! Great post & congrats to the nephew! Heck of a way to pass on the tradition. Congrats to the young man and to you Unc. Great job, all the way around. Congrats to him! Great buck. Heck yeah, that's what its all about, congrats to your nephew. I love hearing stories like this. This right here made my day! Last edited by kruppa24; 10-11-2018 at 07:53 AM. Congrats to him on an outstanding trophy. And props to you for being a positive role model for that young man. I bet it makes you proud that you are the first one he called to share his success! Great story and thanks for sharing it. My day just started off with a bang! Nice buck, congrats to him! Dang good one too. Congrats! Congratulations to the young man! Love hearing of determination to achieve a goal.With young folks like your nephew, there is hope for the next generation. Great job. Awesome! Heck of a first buck! Congrats to him! Man, that is awesome! Congratulations to the young man! And to you as well, Uncle! WOW, that is so cool. All that hunting and sitting paid off for him in a big way. Congratulations to both of you as it sounds as if you helped him a lot along the way. Congrats to him! He's going to ride the high off that hunt for a long time. Awesome buck! Awesome! Great deer and congrats to a young hunter getting it done! I can remember being that age and couldn't get out of school fast enough to get in the stand. Congrats! !